James Humphries Hogan (1883-1948) designed the stained glass windows at the Church of the Heavenly Rest. He was a noted stained glass artist for James Powell & Sons (Whitefriars), Ltd. of London from age 14 until his death in 1948. He made windows for many of England’s churches including the 100 foot high central windows of Liverpool Cathedral. 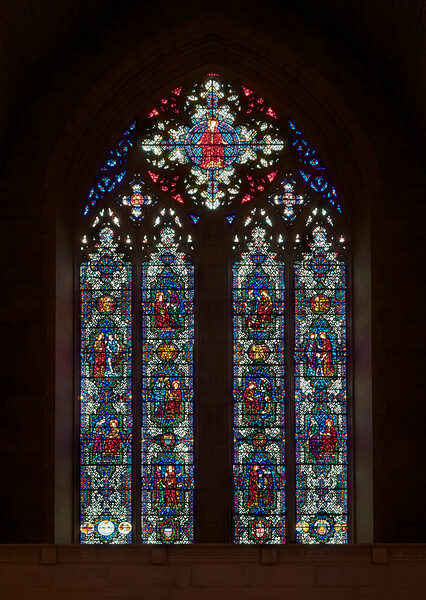 He also worked on most of the windows in Saint Thomas Episcopal church on 5th Avenue in Manhattan. The firm of James Powell and Sons, also known as Whitefriars Glass was an English glassmaker and stained glass window manufacturer. The company started in the 17th century but became well known as a result of the 19th century Gothic Revival. In 1962 the company name was changed back to Whitefriars Glass Ltd. It specialized in freeform glass ware until Caithness Glass purchased the firm in 1981. See Wikpedia for more detail.